Copyright Photo Above: Joe G. Walker. Following the tragic accident of flight ET 302 on March 10 with Boeing 737-8 MAX 8 ET-AVJ, Ethiopian Airlines has decided to ground all Boeing 737-8 MAX fleet effective yesterday (March 10), 2019 until further notice. Although we don’t yet know the cause of the accident, we had to decide to ground the particular fleet as extra safety precaution. Meanwhile in China, “the Civil Aviation Administration of China ordered today (Monday, March 11), that all domestic Boeing 737 MAX 8 jets be out of the air by 6 p.m. local time, due to its principle of “zero tolerance for safety hazards.” according to CNN. China’s airlines currently operate a total of 97 MAX aircraft. Above Copyright Photo: Air China Boeing 737-8 MAX 8 B-1399 (msn 60880) PEK (Michael B. Ing). Image: 944478. In the wake of the tragic loss of Ethiopian Airlines Flight 302 on March 10, 2019, which was being operated by a Boeing 737 MAX 8 aircraft, Cayman Airways extends its condolences to the families and loved ones of the passengers and crew on board that flight. “While the cause of this sad loss is undetermined at this time, we stand by our commitment to putting the safety of our passengers and crew first by maintaining complete and undoubtable safe operations, and as such, we have taken the decision to suspend operations of both our new Boeing 737 Max 8 aircraft, effective from Monday March 11, 2019, until more information is received,” said Cayman Airways President and CEO, Fabian Whorms. 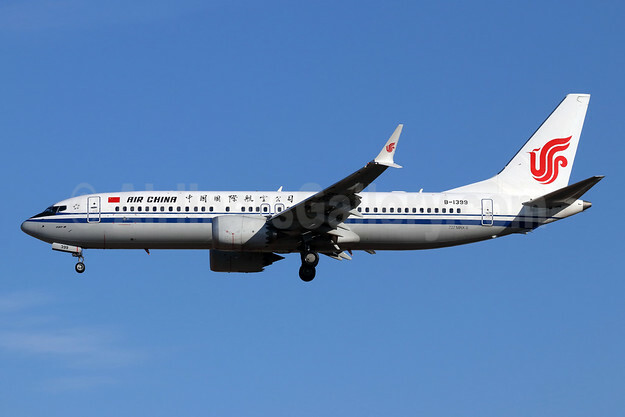 This entry was posted in Air China, Cayman Airways, Ethiopian Airlines and tagged Air China, B-1399, Boeing 737-8 MAX 8, Cayman Airways, Ethiopian Airlines, Ethiopian Airlines flight ET 302, msn 60880 on March 11, 2019 by Bruce Drum. 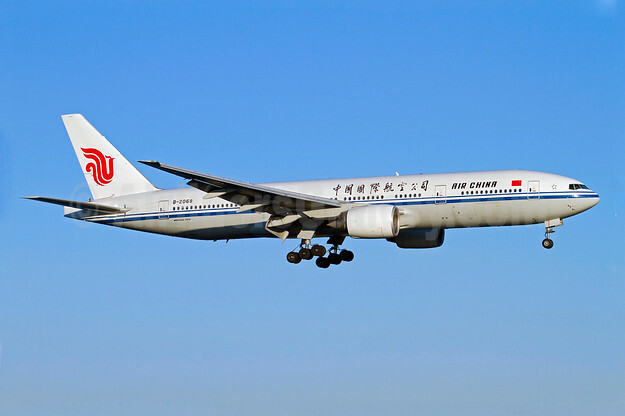 Air China on August 31, 2018 operated its last two regularly scheduled revenue flights with its last two Boeing 777-200s (B-2068 and B-2069). B-2069 operated the last flight, flight CA 1316 from Guangzhou to Beijing. The two aircraft are presumably available as back-up aircraft in the short term before final dispersal. Copyright Photo: Air China Boeing 777-2J6 B-2068 (msn 29747) ARN (Stefan Sjogren). Image: 907687. This entry was posted in Air China and tagged Air China, B-2068, Boeing 777-2J6, msn 29747 on September 4, 2018 by Bruce Drum. Air China Limited, together with its subsidiaries, announced its results for the 6 months ended June 30, 2018. In the first half of 2018, China passenger aviation market grew steadily in demand and supply while outbound travel and international traffic demand continued to rise with a rapid growth, and there was a faster growth in capacity supply. The Group has capitalized on market opportunities by prudently optimizing its production organization, stabilizing income level and strengthening cost management to reinforce its competitive advantage in the core business. In spite of unfavorable factors such as higher jet fuel prices and depreciation in exchange rates, the Group has delivered solid results for the Period. In the first half of 2018, the Company newly launched (resumed routes included) 28 domestic and international routes, comprising 21 domestic and 7 international routes. As for the Beijing Hub, the Company launched international routes of Beijing–Barcelona, Beijing–Houston–Panama, Beijing–Copenhagen, Beijing–Hanoi, etc. ; as at the end of the Period, the Company launched around 30 direct routes from Beijing to the countries along the Belt and Road. The capacity of Beijing as one of the key bases increased by 6.8% year-on-year by optimizing the capacity deployment structure of the Beijing Hub and increasing the deployment of wide-body aircraft for key routes departing from Beijing. The Group delivered through check-in baggage services on routes from 19 European cities to domestic destinations via Beijing. As at the end of June 2018, this service has covered 35 waypoints in Europe, America and Australia; the number of O&D connected in the Beijing Hub increased to 6,050 from 5,918 as at the end of 2017; the onward transit products of the Beijing Hub were promoted and the passengers transfer services were enhanced. The number of onward transit passengers via Beijingincreased by 25.4% year on year. The Chengdu International Hub launched new international and domestic routes such as Chengdu–Bangkok, Chengdu-Huai’an and Chengdu-Hotan, and the capacity contributed increased by 10.3% year-on-year. 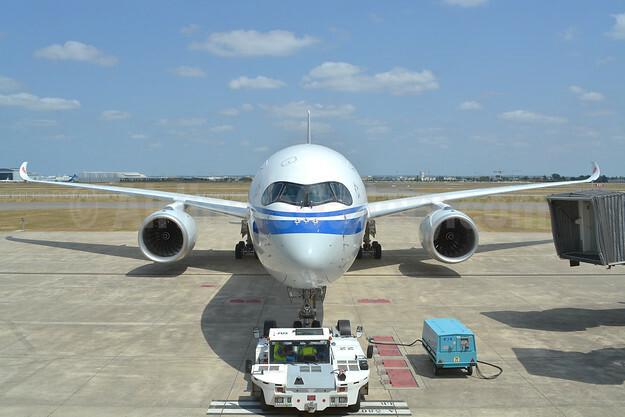 Shanghai and Shenzhen international gateways have continuously improved the planning of route network and deployment of wide-body aircraft through interconnection with surrounding areas. In addition, the quadrilateral strategic layout has been continuously optimized and the route network has been further developed as the Company launched new international and domestic routes such as Hangzhou–Nha Trang, Dalian–Shijiazhuang– Yinchuan, and Hangzhou-Xi’an-Karamay. As at the end of June 2018, the Company’s passenger routes have expanded to 434 in total, across six continents of the world, comprising 308 domestic, 109 international and 17 regional routes. The Company’s network covered 42 countries and regions and 189 cities, including 69 international, 4 regional and 116 domestic cities. 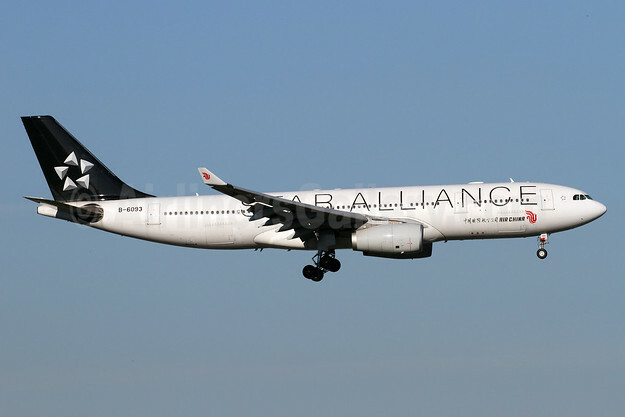 Through Star Alliance, the Company’s route network extended to 1,317 destinations in 193 countries. Top Copyright Photo: Air China Airbus A350-941 B-1086 (msn 167) TLS (Marco Finelli). Image: 943021. This entry was posted in Air China and tagged Air China, Airbus A350-941, B-1086, msn 167 on August 31, 2018 by Bruce Drum. At the Toulouse Airbus Delivery Centre, the first Airbus A350-900 was handed over to Air China on August 8, 2018. The airline has ordered a total of 10. The date of 8-8-2018 was chosen for the handover date as 8s are considered to be a good luck sign in China. At this event the top managers of Airbus, Air China and Rolls Royce were in attendance. Cao Jianxiong, VP of Air China, in his speech remarked on the great steps taken by the airline in renewing the fleet and for climbing in the worldwide airline rankings. Paul Freestone, senior VP of customers for Rolls Royce said “Rolls Royce is a partner with 45 years of continuous relations with Air China, which started with the H.S. Tridents equipped with RR Spey engines until now. The decision of Air China to select the RR Trent XWB is an important sign of this partnership”. George Xu, CEO of Airbus China, reminded “Its so important for the strong relationship between Air China and Airbus. Air China is the first carrier to have ordered the A350 and first to take delivery. Several hundreds of planes made by Airbus are in the fleet of Air China from the A320 family, A330s, and now the ultra modern A350s”. During this month, the new jet will be introduced between Beijing and Shanghai by August 14, 2018 and later to Chengdu. 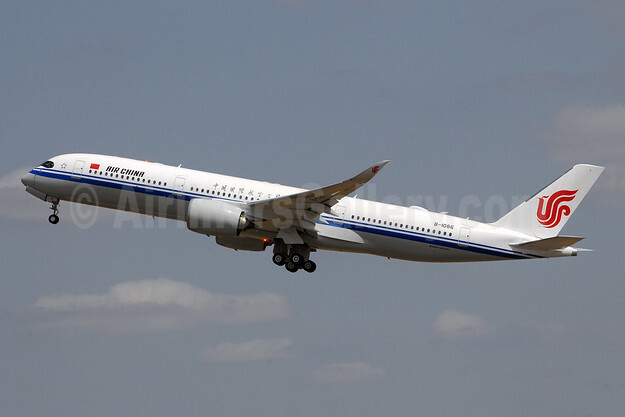 Air China choose to outfit the new widebody jet in a triple class layout. The 312 seats are: 32 in business class with 1-2-1 abreast, 24 in premium economy in 2-4-2 and 256 seats in economy in 3-3-3. All the seats are equipped with personal IFEs. This year Air China will receive at least 4 A350-900s of the 10 on order. Five European destinations will see this new twin jet in 2018 and 2019: Frankfurt, London (Heathrow), Milan (Malpensa), Munich and Paris (CDG). Marco Finelli reporting from France. All photos by Marco Finelli. Copyright Photos: Air China Airbus A350-941 B-1086 (msn 167) TLS (Marco Finelli). Image: 943021. This entry was posted in Air China and tagged Air China, Airbus A350-941, B-1086, msn 167 on August 10, 2018 by Bruce Drum. Air China took delivery of its first A350-900 in Toulouse today (August 8). The national flag carrier is the first Chinese mainland customer to order and take ownership of the world’s newest and most efficient twin-engine widebody aircraft. Powered by Rolls-Royce Trent XWB engines, Air China’s A350-900 aircraft features a comfortable three-class cabin layout of 312 seats: 32 business, 24 premium economy and 256 economy. The airline will initially operate the new aircraft on its domestic routes, followed by flights to international destinations. As of July 2018, Air China operates an Airbus fleet of 201 aircraft, including 142 A320 Family aircraft and 59 A330 Family aircraft. 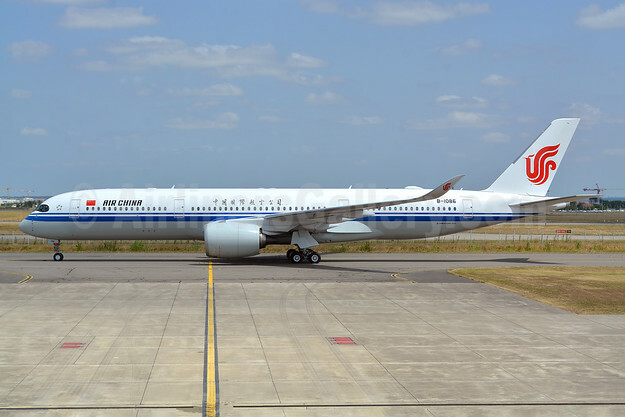 This entry was posted in Air China and tagged Air China on August 8, 2018 by Bruce Drum. On June 6, 2018 at a ceremony in Beijing attended by Jianjiang Cai, Chairman of Air China; Zhiyong Song, President of Air China; and Calin Rovinescu, President & Chief Executive Officer of Air Canada, Air China and Air Canada signed the first joint venture agreement between a Chinese and North American airline, deepening the two carriers’ longstanding partnership. The joint venture enables the two countries’ flag carriers and Star Alliance members to expand their existing codeshare relationship and deepen it by increasing commercial cooperation on flights between Canada and China and on key connecting domestic flights in both countries to provide customers travelling between the two countries with greater and sustainable benefits including an unparalleled range of flights, products and services. As the joint venture is phased in over the course of the next six months, customers will be able to enjoy exceptional travel options through , It will also enabe us to bring flexible flight choices, favorable fare products and seamless travel experiences, optimized flight schedules, harmonized fare products, joint sales including corporate and marketing programs, aligned frequent flyer privileges, reciprocal lounge access and an overall enhanced travel experience. The carriers’ recently expanded code-share, effective May 5, 2018, increases the number of Canada–China connecting flight opportunities for customers by 564 each day. In December 2017, Air China and Air Canada implemented an expanded reciprocal lounge agreement for customers and introduced the airlines’ first joint frequent flyer promotion for their respective PhoenixMiles and Aeroplan members. In the last two years, Air China has launched flights directly linking Beijing with Montreal, and Air Canada has launched new non-stop flights between Montreal and Shanghai to meet growth in demand. The two carriers now operate up to a total of 52 trans-Pacific flights per week between Canada and China from Toronto, Vancouver and Montreal to and from Beijing and Shanghai. This entry was posted in Air Canada, Air China and tagged Air Canada, Air China on June 6, 2018 by Bruce Drum. Air China Ltd. launched a new, nonstop service between Chengdu and London on July 3, 2018. The nonstop route will carry Air China passengers from China’s “Land of Abundance” to the beautiful banks of the river Thames. In recent years, Air China has been expanding its international and domestic route networks, centered around its main hub in Beijing, and supported by its three regional bases in Chengdu, Shanghai and Shenzhen. As part of this effort, Air China has recently launched international routes between Chengdu and Frankfurt, Paris, Sydney and Bangkok. Given its geographical advantage, this year Air China will continue to develop Chengdu as a hub and expand its route coverage there, stepping up passenger throughput to European destinations. Currently, Air China operates 82 routes out of Chengdu. These include 14 international/regional routes to destinations such as Frankfurt, Paris, Sydney, Tokyo, Osaka, Seoul, Bangkok, Singapore, Rangoon, Kathmandu, Colombo, Hong Kong and Taipei, covering the continents of Asia, Europe and Oceania. As a member of the Star Alliance network, Air China also offers convenient routes to 1,330 airports in 192 countries. The Chengdu – London route is operated under flight numbers CA423/4 on Tuesdays, Fridays and Sundays every week. Outbound flights depart from Chengdu at 15:45 and arrive in London at 20:00; return flights depart from London at 22:00 and arrive in Chengdu at 15:40 the following day (all times are local). The new route is operated by Airbus A330-200 aircraft. Business Class travellers enjoy lie-flat seats, while all booking classes enjoy personal in-flight entertainment, ensuring passengers can stretch out and travel in comfort. Copyright Photo: Air China Airbus A330-243 B-6093 (msn 884) (Star Alliance) ZRH (Andi Hiltl). Image: 941990. This entry was posted in Air China and tagged Air China, Airbus A330-243, B-6093, msn 884, Star Alliance on June 6, 2018 by Bruce Drum.